"Island of Paris" redirects here. It is not to be confused with Parris Island or Île-de-France. The Île de la Cité (French pronunciation: ​[il də la site]) is one of two remaining natural islands in the Seine within the city of Paris (the other being the Île Saint-Louis). [a] It is the centre of Paris and the location where the medieval city was refounded. The western end has held a palace since Merovingian times, and its eastern end since the same period has been consecrated to religion, especially after the 10th-century construction of a cathedral preceding today's Notre-Dame. The land between the two was, until the 1850s, largely residential and commercial, but has since been filled by the city's Prefecture de Police, Palais de Justice, Hôtel-Dieu hospital, and Tribunal de commerce. Only the westernmost and northeastern extremities of the island remain residential today, and the latter preserves some vestiges of its 16th-century canon's houses. As of 2013, the island's population was 981. The Mémorial des Martyrs de la Déportation, a memorial to the 200,000 people deported from Vichy France to the Nazi concentration camps during the Second World War, is located at the upriver end of the island. Remains of a defensive Roman wall beneath the parvis facing Notre Dame de Paris. 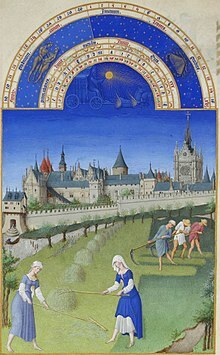 The Île de la Cité in the Très Riches Heures du Duc de Berry, circa 1410, showing the Sainte-Chapelle at right. In 52 BC, at the time of Vercingetorix's struggle with Julius Caesar, the island may have been a fortified crossing point held by the Parisii, a small Gallic tribe. At that time, the island was a low-lying area subject to flooding that offered a convenient place to cross the Seine and a refuge in times of invasion. After the conquest of the Celts, the Roman Labienus developed a settlement on the slopes above the Left Bank, where Roman Lutetia was established. The Emperor Julian, in Gaul from 355 to 361, described Lutetia as "a small island lying in the river; a wall entirely surrounds it, and wooden bridges lead to it on both sides." Later Romans under Saint Genevieve escaped to the island when their city was attacked by Huns. Clovis established a Merovingian palace on the island, which became the capital of Merovingian Neustria. The island remained an important military and political centre throughout the Middle Ages. Odo used the island as a defensive position to fend off Viking attacks at the Siege of Paris in 885-86, and in the 10th century, a cathedral (the predecessor of Notre-Dame) was built on the island. The Île de la Cité remains the heart of Paris. All road distances in France are calculated from the 0 km point located in the Place du Parvis de Notre-Dame, the square facing Notre-Dame's pair of western towers. The Pont Neuf, the "new bridge" that is now the oldest bridge in Paris, was completed by Henry IV, who inaugurated it in 1607. The bronze equestrian statue of Henry IV was commissioned from Giambologna under the orders of Marie de Medici, Henry's widow and Regent of France, in 1614. After his death, Giambologna's assistant Pietro Tacca completed the statue, which was erected on its pedestal by Pietro Francavilla in 1618. It was destroyed in 1792 during the French Revolution, but was remade from surviving casts in 1818. The sculpture originally rose from the river on its own foundations, abutting the bridge; since then, the natural sandbar building of a mid-river island, aided by stone-faced embankments called quais, has extended the island, which is planted as the teardrop-shaped Parc Vert Galant in honour of Henry IV, the "Green Gallant" King. The Place Dauphine, laid out in 1609 while the Place des Vosges was still under construction and named for the Dauphin of France, the future Louis XIII,[d] was among the earliest city-planning projects of Henry IV. The space, essentially a triangle because of its promontory location, was made over to Achille de Harlay [fr] for development. Twelve lots were sold, and forty-five irregularly sized houses were constructed behind a standardised façade. The houses were built of brick with limestone quoins supported on arcaded stone ground floors and capped by steep slate roofs with dormers, very like the contemporaneous façades of Place des Vosges. There were originally two entrances to the Place Dauphine, one at the "downstream" point, through a kind of gateway centred on paired pavilions facing the equestrian statue of Henry IV on the far side of the Pont Neuf, and the second in the centre of the eastern range. Badly damaged during the turmoil of the Paris Commune of 1871, the eastern range was swept away in 1872 to open the view to the monumental white marble Second Empire Palais de Justice (built 1857–68), like a glazed colonnade[e] centred on the Place Dauphine, the remains of which now form a kind of forecourt to it. Few visitors penetrate the Place Dauphine, which lies behind them, and where all the other buildings have been raised in height, given new façades, rebuilt or replaced with heightened pastiches of the originals. Cathedral of Notre Dame de Paris, built from 1163 on the site of a church dedicated to Saint Étienne, which in turn occupied a sacred pagan site of Roman times. During the French Revolution the cathedral was badly damaged, then restored by Viollet-le-Duc. The Cathedral was heavily damaged, but not totally destroyed, in a fire on 15 April 2019, while undergoing the initial stages of a massive renovation- materials from the renovation are currently believed to have started the devastating, large fire. Louis IX's Sainte-Chapelle (1245), built as a reliquary to house the Crown of Thorns and a piece of the True Cross, enclosed within the mid-19th century Palais de Justice. Conciergerie prison, where Marie Antoinette awaited execution in 1793. The oldest remaining residential quarter is the Ancien Cloître. Baron Haussmann demolished some of the network of narrow streets, but was dismissed in 1869 before the entire quarter was lost. Old engraved maps of Paris show how, when the Pont Neuf was built, it grazed the downstream tip, the "stern" of the island-ship. Since then, the natural sandbar building of a mid-river island, aided by stone-faced embankments called quais, has extended the island, which is planted as the small Vert Galant park ("square du Vert-Galant"), named for Henry IV of France, the "Green Gallant" king whose statue stands near the center of the bridge. It retains the original low-lying riverside level of the island. Nearby, a discreet plaque (removed prior to 01/06/2017 and replaced with a printed sign) commemorates the spot where Jacques de Molay, Grand Master of the Knights Templar, was burnt at the stake, 18 March 1314. The upstream tip of the island is the site of the Mémorial des Martyrs de la Déportation, a memorial to the 200,000 French citizens who were deported to German labour camps during the Second World War. The Île de la Cité is connected to the rest of Paris by bridges to both banks of the river and to the Île Saint-Louis. The oldest surviving bridge is the Pont Neuf ('New Bridge'), which lies at the western end of the island. The island has one Paris Métro station, Cité; and the RER station Saint-Michel-Notre-Dame on the Left Bank has an exit in the square in front of the Cathedral. ^ The Île aux Cygnes is artificial. ^ Floods destroyed the bridge at intervals, the last houses being removed in 1809, and the present bridge was constructed in 1857. (Photos et historique: Le pont Saint-Michel). ^ The present bridge dates from 1853, with the central arches replaced by an iron span in 1967. (Photos et historique: Le pont Notre Dame). ^ Pronunciation of Île de la Cité at PronounceItRight.com (retrieved 6 October 2015). ^ Ballon 1991, p. 151. Ballon, Hilary (1991). The Paris of Henri IV: Architecture and Urbanism. Cambridge, Massachusetts: The MIT Press. ISBN 9780262023092.
de Brunhoff, Jacques (1987). La place Dauphine et l'île de la Cité (in French). Lyon. ISBN 2904638997. L’Île de la Cité- current photographs and of the years 1900. Wikimedia Commons has media related to Île de la Cité.